This is a little something I invented for a super healthy dinner recently. This summer I tasted my first Banh Mi sandwich, a Vietnamese dish which seems to be very popular these days. I loved it, but I wanted to make a healthier version, and something for people who can’t eat gluten or are trying to stay away from it. So I made this version with tons of veggies, and chose to put in tofu instead of meat. I also made it once with shrimp, but I preferred the tofu version because the sauce it is made in is so yummy. If you substitute meat make sure it is something with a flavourful sauce – there are tons or recipes available on the internet. So the idea for the rice paper wrap is mine, but the sauce for the tofu comes from Mark Bittman. I made his recipe a little simpler by using the tofu right out of the package; his recipe calls for cutting, freezing and thawing the tofu – way too much work! And it also tasted great this way. You can alter the fillings, but it really needs to have some cilantro, cucumbers, jalapeno slices, pickled carrots, and something with a sauce, like tofu or meat. Make the pickled carrots/daikon ahead of time. Just combine the water, rice vinegar, sugar or honey, salt and chili flakes and stir to combine. Then add the carrot and give it a little stir. Let this sit for at least 1/2 hour or overnight. I made mine a day ahead of time. Double the recipe if you add daikon. To make the caramelized tofu put the sugar into a large skillet over medium-low heat with 1 tablespoon of water. Cook for about 10 minutes, shaking the pan from time to time, but not stirring – not stirring is an important to get your sugar to caramelize properly. ( watch a video on how to caramelize here) It will be done when it is a golden brown colour. When the sugar has caramelized, slowly add the soy sauce and fish sauce. Add the onion and cook, stirring often, for about 8-10 minutes, or until the onion is softened. Add the tofu and pepper and cook, stirring occasionally, for about 15 minutes or until the tofu has absorbed a lot of the sauce. Add the tablespoon of rice vinegar and remove from the heat. Boil some water to prepare the rice paper. Get all your topping chopped and ready to assemble the wraps. 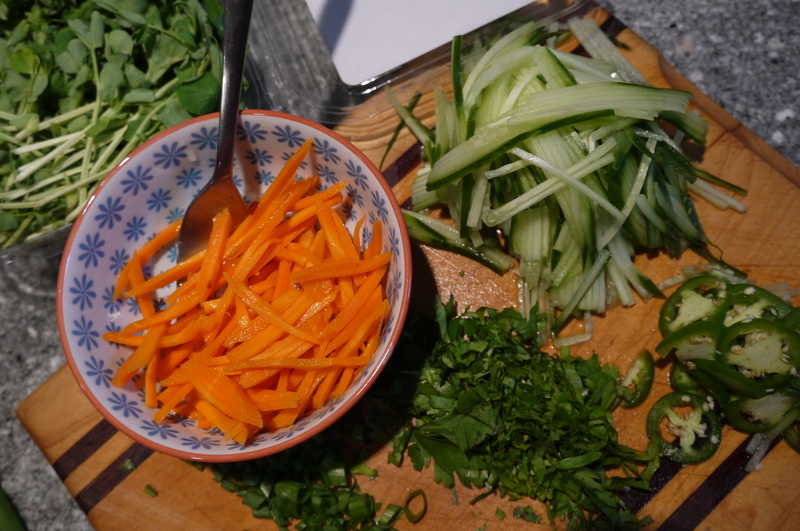 To prepare the rice paper, pour some very hot water into a dinner plate or shallow pan. Place one sheet of rice paper into the water and let it sit for a few seconds, until it becomes more pliable, but not so much that it tears apart easily. 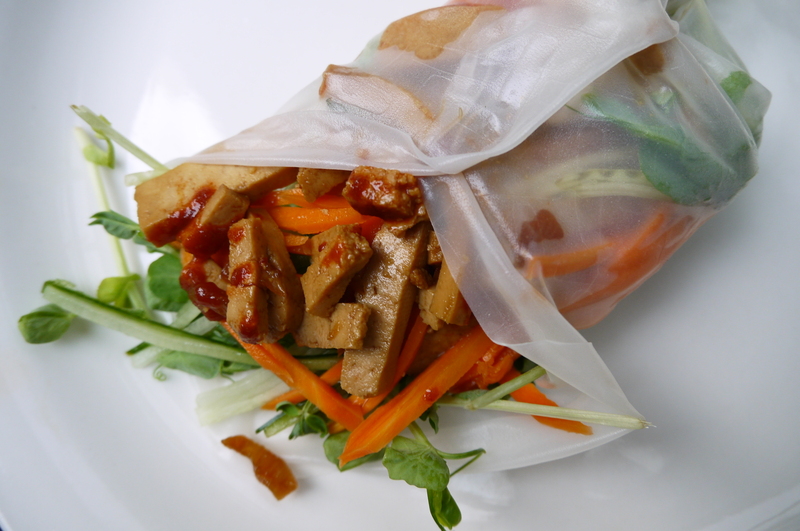 Remove the rice paper from the water and place fillings in the middle, leaving room to fold the edges into a wrap. Add vegetables and tofu with sauce, then top with some jalapeno slices and Sriracha sauce to your liking. Fold the bottom of the rice paper part way up then fold the left and right sides over each other, leaving the top open. Eat it right away. The rice paper doesn’t like to be kept waiting, and will turn crusty. I like to let people add what they like to their own wraps, so I just lay out all the options and they can go to it. What would the filling normally have been in before you changed it? A bun or roll? Is the combinations of fillings what makes it bahn mi? With the rice paper it is pretty much a Thai fresh roll, though with a much more savory filling. Fish sauce is not vegan btw nor honey, though you did mention the alternative there. To replace fish sauce in recipes I have used crumbled moistened seaweed. There might be other alternatives but as I don’t know what fish sauce tastes like I am only guessing.